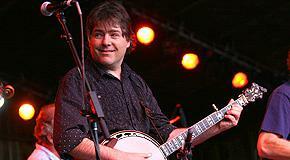 Banjoist Béla Fleck – winner of 15 Grammy Awards and nominated in more categories than any other artist in Grammy history – is as iconic on his instrument as Vladimir Horowitz or Mstislav Rostropovich were on theirs. Now, like those classical greats, Fleck will be joining the storied roster of Deutsche Grammophon. Reaching beyond his exalted status as an “itinerant superpicker” (All Music Guide), he makes his DG/Mercury Classics debut as a composer-performer with The Impostor, to be released August 13. The album showcases Fleck’s title concerto for banjo and symphony orchestra, as well as Night Flight Over Water for banjo and string quartet. For The Impostor concerto, the banjoist teamed with conductor Giancarlo Guerrero and the Nashville Symphony (which commissioned the work); for Night Flight Over Water, a work commissioned by Butler University, Fleckpartnered with genre-bending quartet Brooklyn Rider. Fleck will be performing both of these works in the upcoming season, starting with The Impostor on August 21 with the Philadelphia Orchestra in Saratoga, NY. Further concerto dates follow in the fall with the North Carolina Symphony (Sept 24) and Indiana University Symphony (Oct 30). Fleck will also tour Night Flight Over Water extensively with Brooklyn Rider, beginning with a nine-date trek around North America in November. In the early 1980s, Fleck collaborated with Edgar Meyer on a work for the Blair String Quartet, and the experience made him eager to try a chamber work on his own. His ambitions really took off after encountering the members of Brooklyn Rider: Colin Jacobsen (violin), Johnny Gandelsman (violin), Nicholas Cords (viola) and Eric Jacobsen (cello). Beyond the November tour of North America, Fleck and Brooklyn Rider will continue to tour Night Flight Over Water in January and February 2014. ~ by Daniel Buckley on July 10, 2013.